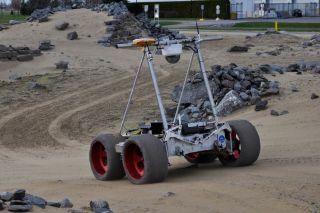 The Juno rover, built by Canadian company Neptec for Mars-like environments, goes through its paces in October 2012 on simulated Mars terrain built near the Canadian Space Agency. Canada's government will chip in $5 million to help its space experts compete for robotics contracts, according to an announcement made in Montreal today (Feb. 8). Scientists developing planetary rovers and other types of space robotics will receive the grant money over five years from the government's Natural Sciences and Engineering Research Council. Another $5 million will come from in-kind and cash contributions from several companies, including major space players such as Neptec and Canadarm maintainer Macdonald, Dettwiler and Associates. The Canadian Space Agency will offer use of its facilities. While the United States, European Union and other countries are putting together their own robotics networks, the NSERC Canadian Field Robotics Network has an annual budget of $2 million, a large sum in Canadian terms. "In the Canadian landscape, this is an exceptional investment. I think it is enough to be a significant contribution to making us better, and making us among the best – if not the best – in the world." Although the Canadian Space Agency is facing deep budget cuts, the government recently deemed robotics as a priority area for economic stimulus funding. Ottawa allocated $110 million to the agency in 2009 to principally develop rover and robotic arm prototypes, money that has all been spent. More than 50 percent of the new grant money will go to student stipends and scholarships. There also will be allocations for equipment, as well as for academics and companies to do field tests. Working together could be tricky, given that many Canadian academics compete for research funds and that companies typically vie for the same CSA contracts. The collaborators, however, acknowledge this is just "the nature of life," said Gregory Dudek, a computer science researcher at McGill University, where the network is administered. "There's always a temptation to compete, but it's better to collaborate against the challenges facing you," said Dudek, scientific director of the robotics network. He cited competition for contracts from Japan, South Korea, the European Union and the United States as the primary challenge for Canadian researchers. Collaborations will take place most visibly through an annual field test to put robots through their paces. These will be similar to rover tests that took place at a simulated "Mars yard" near the CSA last year, but will expand to include environments such as in water. These tests are essential because they expose limitations in a design, said Tim Barfoot, the head of the University of Toronto's autonomous space robotics lab. Fieldwork he oversaw with a rover in a Mars-like environment, for example, revealed a more efficient way for it to move around obstacles. "Our approach to navigating robots fundamentally changed because of these observations," he said. Additionally, the network partners will build a common set of tools – especially software tools – that everyone can use for the various projects. "Not every flying robot, swimming robot and land robot can use the same software, obviously, but we’re trying to build bridges between the big players in Canada so they can share stuff, interoperate and work together," Dudek said. The United States announced its own national robotics initiative in 2012. The project, which includes agencies ranging from NASA to the U.S. Department of Agriculture, is supposed to create new applications for robotics technologies. Canada's new government grant comes amid a period of program uncertaintyfor its space agency. The CSA faces a 20 percent budget cut this year. Its president, Steve MacLean, left Feb. 1 to join a quantum physics venture. Gilles Leclerc is now acting president. In an October interview, Leclerc said he hoped the government would provide more money for robotics now that the stimulus funding is spent. "We will see what the government does with the aerospace and space review, and how high space ranks as a priority," said Leclerc, then the CSA's director-general of space exploration. "Somewhere in the future we can develop a rover [for flight], or at least provide signature technologies in robotics and vision systems. That's our Canadian heritage."